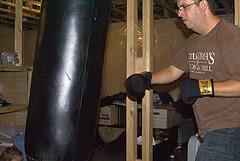 A punching bag is one of the favorite fitness accessories. This sturdy bag is designed to be repeatedly punched. It is often used during the physical exercise or for a stress relief. Punching bags have been used in martial arts for centuries to improve punching technique and speed. Almost every well-equipped fitness center has a choice of punching bags and many fitness enthusiasts have their own punching bags at home. Typically, they are filled with grains, sand or other material, and hang from a ceiling or a stand. Punching bags are designed in such a way to absorb the force of punches without causing any harm to the user. Properly conducted, punching bag training can improve one’s self-defense ability, overall health, fitness and sense of well being. Here are some great examples of punching bag exercises. Before engaging into any kind of training, make sure to warm up properly. A simple warm-up routine involves about 10 minutes of light cardio exercises. One can start the warm up by doing a couple of gentle stretching exercises. The goal is just to warm up the muscles by improving blood circulation and overall flexibility. Jabs are great exercise for beginners. This light exercise boosts cardio performance and helps to release the stress and tension. A jab is just a type of punch where the exerciser stands in a fighting stance and throws a fist straight ahead towards the punching bag. One minute of eye-level jabs, while circling around the bag, is great for the start. The exerciser should feel free to continue with double jabs in circling motion and finish with some random footwork. This exercise is also known as the right cross. It is one of the most important power punches. In martial arts, this punch is typically thrown with the dominant hand the second an opponent leads with his or hers opposite hand. This accurate punch should make a punching bag jump. It is recommended to start with some eye-level straight punches with the right hand and follow with the left hand. An exerciser should also try to swap between straight punches to the head and to the body. Hooks are powerful single punches. It is important to train both left and right punches. The first part of the exercise should include just isolated left or right hooks. The exerciser should also throw from a close range and even press the opposite shoulder against the bag. It is important to concentrate on technique and proper footwork. Why Is Cardio A De-Stressor? Eat before or after Exercise? Early cardio before breakfast, yes or no? why is breathing important during exercise? Strong loud visible heartbeats that shake my whole body!